Carrfour Supportive Housing broke ground for Barbara Carey Shuler Manor in Liberty City today. The community will provide 100 units of affordable housing and an array of supportive services when it opens next year, including innovative programs to help reduce and prevent poverty. 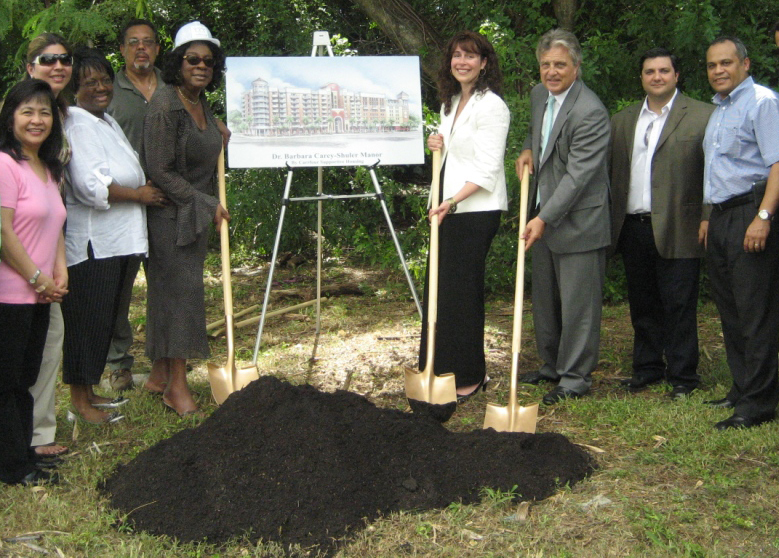 Liberty City, Florida — Carrfour Supportive Housing broke ground on Barbara Carey Shuler Manor in Liberty City today. The mixed-use community will provide 50 units of affordable housing and 50 units for the formerly homeless along with an array of supportive services to help residents achieve independence. The $28 million eight-story complex is being funded by $21 million in stimulus monies, $3 million from Miami-Dade County, a $2.5 million State Apartment Incentive Loan, and the balance from an FHFC loan. The community is scheduled to open in 2011. Stephanie Berman, president of Carrfour, said the organization expects the project will help revitalize one of Miami-Dade’s most distressed neighborhoods. “The need for affordable housing and supportive services is increasing throughout South Florida,” Berman said. “The challenges facing the children and families of Liberty City are particularly difficult. The array of supportive services Carrfour provides along with stable housing are key to empowering residents with the opportunities needed to achieve self-sufficiency,” she said. Established in 1993 by the Homeless Committee of the Greater Miami Chamber of Commerce, Carrfour is Florida’s largest nonprofit provider of supportive housing for the formerly homeless. In addition to affordable housing, Carrfour’s 94 percent success rate helping residents achieve self-sufficiency is built on an array of supportive services, including case management, substance abuse treatment, credit counseling, skills training, and job placement assistance. Congressman Kendrick Meek represents the 17th Congressional District that includes Liberty City. He’s fought to bring increased federal funding to the district to help local government and community organizations address urgent needs for housing, jobs and supportive services while promoting preventive approaches to reduce cycles of poverty and homelessness. In addition to his support for stimulus funding that is providing the bulk of the monies needed for construction of the Liberty City housing complex, this week Congressman Meek reached out to the U.S. Department of Health and Human Services and fellow members of the House Ways and Means Subcommittee on Income Security and Family Support to highlight the positive impact of supportive services. Healthy Marriage programs are offered throughout South Florida, including to Carrfour residents, by the nonprofit PAIRS Foundation to deliver evidence-based, skills training that strengthens family cohesion and reduces conflict. Programs have been widely available in the community since 2006, when the PAIRS Foundation was awarded a $5 million, multi-year grant to provide relationship skills building programs in Miami-Dade, Broward and Palm Beach counties. Dr. Shirley Johnson, a Miami-Dade County Public Schools Supervisor, agrees. She recently encouraged PAIRS Foundation to offer supportive services to children, parents and teachers at Liberty City Elementary School to help local families develop skills to prevent the fragmentation that often leads to poverty. Seth Eisenberg, President of the nonprofit PAIRS Foundation, said the organization expects to expand services in Liberty City with the opening of Barbara Carey Shuler Manor next year. “While stable housing must be the beginning of community efforts to help the most vulnerable members of our community, skills training that empowers residents to strengthen marriages and families, promotes cooperation among neighbors, and helps them succeed in the workplace have been shown to be vital building blocks,” he said.